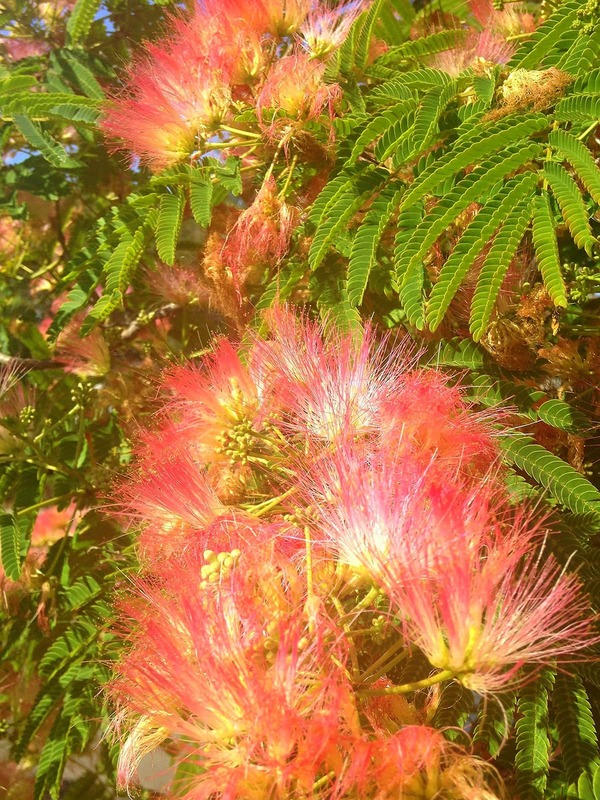 Mimosa, also known as the Silk Tree, has graceful fern-like foliage. Additionally, from June through August, it is covered in fragrant, fluffy, pink powder puff flowerheads. This attractive native of Asia (from Iran to Japan) is widely planted in milder climates of the world and does very well in Santa Barbara. Being deciduous, it will drop its leaves in the fall, remain starkly bare for several months in the winter, and push out its show of new dark green leaves in spring. The flowers bear a sweet nectar that provides nutritious food for bees and butterflies. They are followed by flat, bean-like, seed pods (to 6” long) that persist into winter. Mimosa has a distinctive growth habit – an umbrella-like, broad, flat-topped canopy that normally reaches a maximum height of 30 feet with a spread of 40 feet. It is relatively fast growing, so you do not have to wait long after planting to enjoy its full beauty! This tree is well adapted to the various soils and microclimates around Santa Barbara. Once established, it can survive on normal rainfall, but looks better with several deep watering sessions during the dry season. In wetter areas, it can be invasive, but that is not a problem here in our Mediterranean climate. 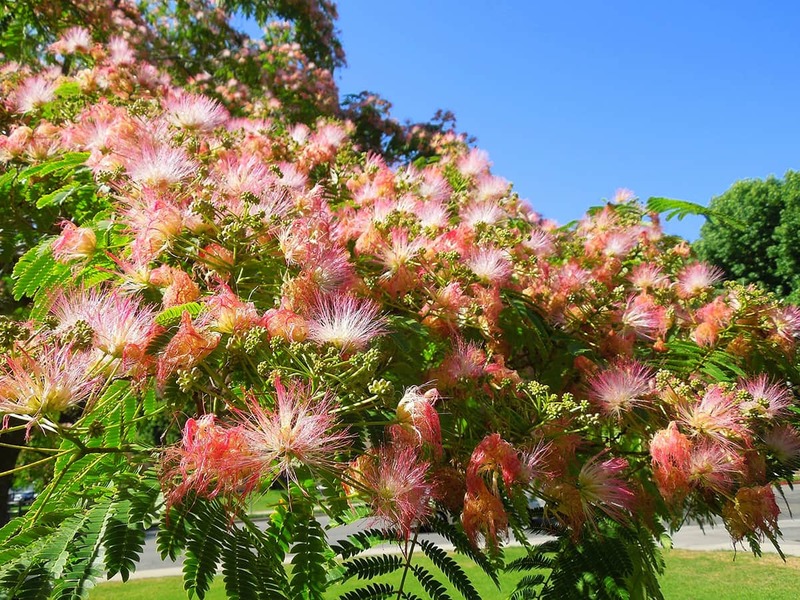 Mimosa’s botanical name is Albizia julibrissin. 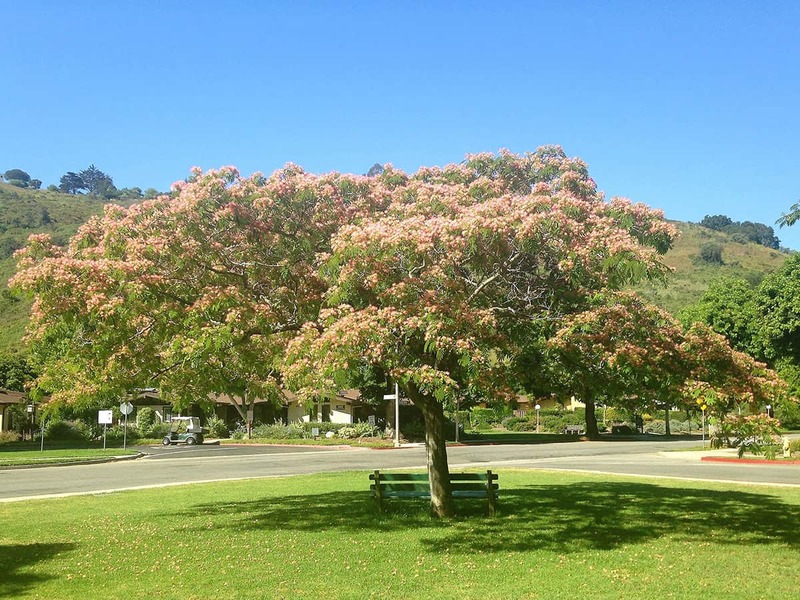 The genus name, Albizia, recognizes the Italian naturalist who introduced it to Europe in 1749. The species name, julibrissin, is derived from a Persian word meaning “floss silk”. Remarkably, its sensitive leaves fold up when touched and at night, giving it its Japanese name, “Nemunoki”, meaning “sleeping tree”. The variety “Rosea” has deeper pink flowers and is smaller in size than the standard. Mimosa have planted in Santa Barbara since the late 1800’s. They are seen as street trees in the 500 to 700 blocks of Voluntario Street, and have been planted as landscape trees in Hidden Valley Park, Lower Orpet Park, and many private gardens in the city. Tree-of-the-Month articles are sponsored by Santa Barbara Beautiful, whose missions include the increase of public awareness and appreciation of Santa Barbara’s many outstanding trees and, in a long-time partnership with the City Parks & Recreation Department, with the funding and planting of trees along the City’s streets – a project which has resulted in the planting, to date, of more than 12,000 street trees.